One of the reasons why governments all over the world changed their stance in regards to Marijuana is that this substance has so many medical benefits that they easily outweigh potential negatives. Medical marijuana is a general term used to describe a wide range of remedies that contain cannabinoids. The list of diseases that can be treated with marijuana is quite long and includes various neurological and physiological conditions such as multiple sclerosis, nausea induced by chemotherapy, and many others. Marijuana has many potential uses and can be consumed in many forms. You can smoke it, inhale its vapors, eat with food or rub it in your skin. The flexibility of the remedy is what makes it popular. It is truly a very effective medication that provides a plethora of notable benefits. Obviously, it should be used carefully due to potential adverse effects. Who qualifies to use it legally? The legality of certain forms of medical marijuana depends on a variety of factors including your health condition, prescribed cannabinoids (THC or CBD), and whether you have specific symptoms in your medical card. For example, experiencing nausea or vomiting are strong symptoms for medical cards of people who undergo chemotherapy. Each state has its own acts legalizing marijuana for specific conditions. Each state provides its own guidelines in regards to qualifications of users and has expansive lists of medical symptoms that can be used as references by doctors and law enforcement. You will need to check your state laws and make sure that you can use cannabinoids to treat medical issues. Note that in some states you can use only CBD-based remedies while in other states using THC-based remedies is not permitted. In most states, you can use CBD-based preparations to treat a vast variety of medical conditions including those listed above and other conditions such as ADHD, Alzheimer’s, bipolar disorder, migraines, and alcoholism. The widely recognized therapeutic effect of medical marijuana is accredited to the CBD component that has a distinct sedative effect and calms you down. CBD is an abbreviation for cannabidiol which is a non-psychotic phytocannabinoid used to treat predominantly neurological conditions to great success. This particular cannabinoid is one of the reasons to use medical marijuana. You may have noticed that the list of diseases that determines who qualifies for the marijuana treatment contains many neurological conditions such as Parkinson’s and PTSD as well as multiple sclerosis and other diseases affecting the CNS. Numerous scientific studies researched the extent to which CBD can be used to treat pains, neurological disorders, anxiety, and depression. While the vast majority of studies concluded that marijuana in general and CBD, in particular, are very effective at treating these conditions, there are many anecdotal examples against medical marijuana as well as anecdotal evidence in favor of it. For example, several studies showed that using CBD is beneficial in patients with Parkinson’s disease. Clinical trials showed that medication affects individuals differently. While some patients report dramatic improvements to their condition and can control their movements after taking a dose of medical marijuana, some patients do not experience drastic changes. Nonetheless, cases, when CBD does not help at all, are sporadic. Amongst diseases cured by cannabis are anxiety and PTSD. Troubled patients who used marijuana with and without the THC-component reported improvements to their condition and general well-being. At the same time, some said psychotic episodes and other adverse effects when using THC and CBD simultaneously. The general consensus of the scientific community is that medical marijuana notably improves the quality of life of patients with neurological, neurotic, and some psychiatric diseases. THC, on the other hand, is approved by the FDA for anorexia and nausea induced by HIV/AIDS and chemotherapy respectively. Various studies suggest that THC can be used to treat sleep apnea to a certain degree. Why is medical marijuana so effective? Cannabis contains a wide range of cannabinoids including both CBD and THC. 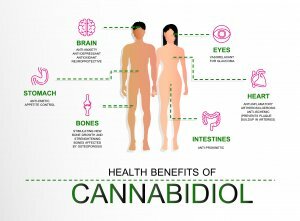 Medical ailments made of derivatives of cannabis are quite effective at treating specific conditions and have been quite popular for a long time under various brand names like cannabidiol and dronabinol. The plant usually contains a massive range of potentially active cannabinoids. Three of them are considered most active: CBD, CBN, and THC. The combination of microelements with psychotic and sedative effects is the reason why marijuana provides different effects on users depending on the factual composition of active components. At the same time, medical marijuana can be dangerous to use since it can induce both beneficial and harmful effects simultaneously. It is important to understand whether you actually have reasons for medical marijuana usage. Consulting with a doctor is recommended before you purchase and start using medical marijuana even if you think that it will be absolutely beneficial for your specific conditions. There are some contradictions and interactions that should be taken into consideration. Your doctor will also help you determine whether you have qualifying conditions for medical marijuana.